There’s people who can you hook you up at Sephora with a fragrance that smells a little bit like a cookie. And then there’s Black Phoenix Alchemy Lab who can hook you up with a fragrance that smells exactly like a cookie. And what a specific cookie! In Bottle: Butter rum cookie smells exactly like its name. It’s not pulling any stops on you, it’s not pretending its something it isn’t, it’s just boozy, sweet cookies. Applied: First thing’s first, the butter rum cookie you smell in the bottle will be what you smell on your skin when you put this on. It’s a really nice, very well done blend of sweet, pastry, and rum. I smell the rum first on application but the note is so fleeting that it’s gone on me in a few minutes. The rest of the time is occupied by a lightly toasted, very rich cookie note. There’s a very subtle spiciness to this that lingers in the background but for the most part, you’ll get the full deal in the first few minutes with a drop off on the rum and hours and hours of cookie-smelling fun until it all fades into what I can only describe as a lightly floured pan scent. Extra: This fragrance was released in 2008 as a part of Black Phoenix Alchemy Lab’s Yule season releases. Design: Butter Rum Cookie is a limited edition fragrance bottled in the standard amber tinted 5ml glass bottle. It has a special label with its name written on it. Notes: Rum, butter note, cookie note, sugar, almond, orange rind. 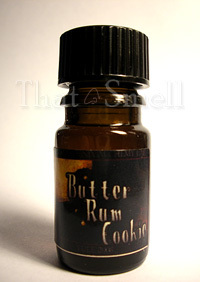 Reviewed in This Post: Butter Rum Cookie, 2008, 5ml. This entry was posted in black phoenix, gourmand, Reviews By House, sweet and tagged black, black phoenix alchemy lab, boozy, bpal, butter, butter rum cookie, cookie, cookies, fragrance, gourmand, perfume, phoenix, review, rum, scent, yule. Bookmark the permalink.